Gourmet Candy Hearts - Made At Home - Makes A Great Gift! I had so much fun creating these heart chocolates. I made them in several varieties, and I am going to tell you how each one turned out! I used the highest-quality ingredients, mostly from the baking aisle and craft stores (for the heart mold and sprinkles). These turned out great! For best results, use a spoon to place toppings into mold. 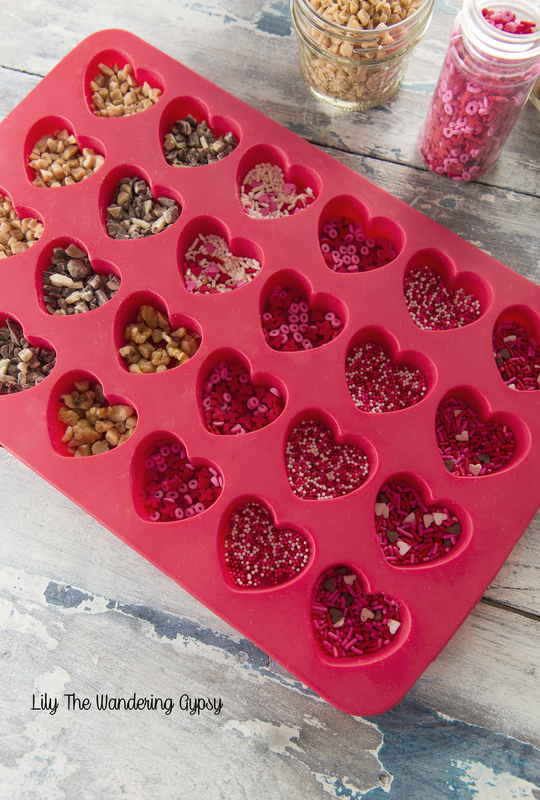 Also - place heart mold onto a baking sheet or cutting board to transport them into the freezer. These would be the perfect Valentine's Day gift for someone who loves sweets but is hard to shop for! These aren't super expensive to make, like some seasonal recipes are, either! Heath - make sure to only use a light, single layer of these or they won't all stick to the chocolate. Andes - My favorite! Fill with Andes about 1/3 of the way. Sprinkles - Look best on white chocolate, rather than milk. Chopped Walnuts - Use only a light layer, similar to Heath. Larger Sprinkles - use a single layer for best results. Now, melt the chocolate! I used a double boiler method (explained here - but do not add any butter). I used a shallow, medium pot and filled it about 1/3 of the way with water. I placed two 2 Cup Pyrex measuring cups in the water for a double boiler. Melt 1 package each of the milk chocolate and white chocolate in separate cups. Slowly melt the chocolates, and stir frequently. They should be smooth and move easily. Once your melted chocolate is smooth, remove the cups with an oven mitt, and place them onto a towel near your work space. Get a little bit of chocolate onto a spoon, and begin adding milk chocolate to half of the hearts. Then, white chocolate to the other hearts. Be careful not to get chocolate everywhere, so your end result is prettier. Here they are after being in the freezer for less than an hour! Make sure they are completely cooled and hardened before you move them. One of my favorite parts was removing the fresh chocolates from the molds and seeing my creations! I liked most all of them, and think they would look adorable packaged up all cute for Valentine's Day, Mother's Day, Birthdays, and more!